There’s no easy way to explain my long-lasting relationship with football. The paradox in which I find myself stuck in here, and to be honest it happens quite too often, is that the more you try to explain and articulate your feelings about it, the less you get to truly understand them. The question about what makes football a matter so full of meanings and so fundamental in the lives of millions of people is maybe a subject future generations will be dealing with in philosophy books with a view to answering it once and for all. As far as I’m concerned, football remains a beautiful as well as an uncanny mystery in itself and that is perhaps indeed the reason why I’ve been so fascinated and obsessed by it since I was born. Being Italian, football was somehow part of my family heritage. Therefore, I’ve grown up watching it and playing it relentlessly first as a keeper and then as a (not prolific) striker. I simply couldn’t have enough of it. In a nutshell, football has been an essential part of my daily life, always a priority which has deserved, therefore, full commitment from my side no matter what. To put things into perspective, during my still short existence, a huge percentage of things has dramatically changed from personal relationships, tastes in music and food, to opinions, ideas, outlooks on the world and hobbies, whilst only my passion for football has withstood unmoved the inevitable and unpredictable course of life. My humanistic background in philosophy, history and later journalism and communication alongside also my first short work experiences did not prevent me from thinking of football as my main concern, quite the contrary actually. Getting older, or mature if you wish, I figure out that football was indeed the industry where I was meant to be as a professional, despite not having still clear in mind the way how to set foot into it and where exactly to position myself in the industry itself. I’ve always been intrigued by what really happens behind the scene, by the deep reasons unknown by the majority that ultimately make this incredible spectacle and product available to the large crowds. As much as I still like watching football compulsively and reading news and articles about it – basically every day – roughly a year ago I came to the conclusion that it wasn’t enough to quench my thirst for the game and, more importantly, to fulfill my life goals in the long run. I truly wanted to touch the core of the matter, I was greedy to know in fact how this industry really works and if possible to be part of the decision-making process one day. Funnily enough, that’s also exactly when by chance I came across an FBA advert on my LinkedIn newsfeed and I decided to take the gamble to apply without qualms since I was already well aware of the fact that nowadays passion is surely important but not enough by itself to succeed in such a competitive and niche market. The first two modules of The FBA provided us with very insightful presentations and lectures on how football is run from different but crucial angles such as sponsorship and partnership, finance, media, law, marketing, political economy. However, the theory must always be matched with experience in the “real world” and that is exactly why the third module of the course is a golden opportunity to practically get involved in the football industry for the first time by using tools and knowledge acquired in the previous months of hard and interesting study. 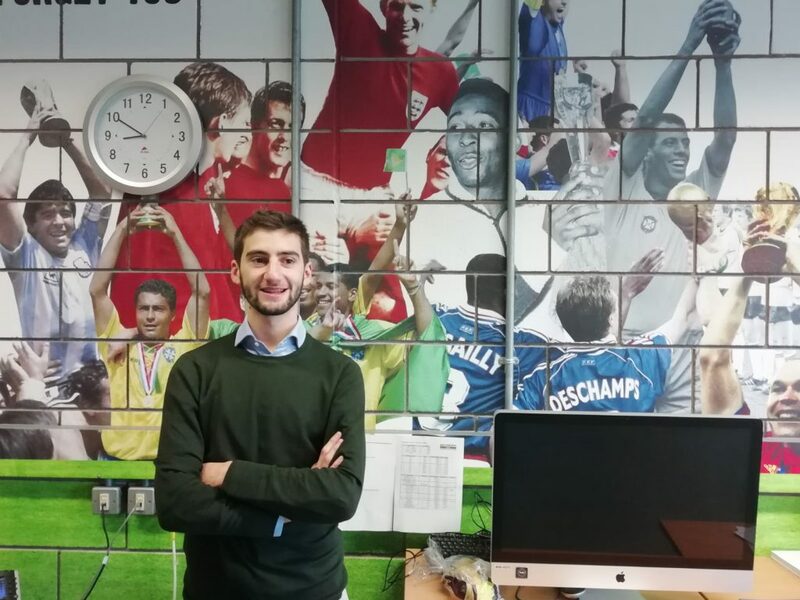 When Kristian, The FBA Partnerships Director, mentioned that there was an opportunity lined up to do my internship at Soccerex in London, I immediately embraced it because I knew it was the right thing for me at the right moment. Now, I’m almost half-way through my time at Soccerex and I feel that I’m way more equipped than I’ve ever been to set foot into the industry once I’ll be finished with this great journey. For those who are not too acquainted with the name, though, it is worth pointing out that Soccerex has been undoubtedly over the last 20 years or so the leading company in organizing B2B football events around the world where companies and rights-holders such as clubs’ executives and federations get to know each other thanks to useful networking platforms and insightful panels. I started my experience at Soccerex when the Miami event was just 5-6 weeks away and this granted me the great opportunity to be in the sales team in quite a hectic and lively time as you might well imagine. No time to adapt whatsoever. I was given, therefore, the chance to look at the actual making of the event from a close range playing also a contribution in it. Since the very beginning, I was right in the middle of the action, immersed in an environment where you literally only deal with football, which is undoubtedly the main and only theme at Soccerex and you can get that by just giving a quick look around the office: signed shirts by legends hung on the walls, rubber mini balls branded Soccerex everywhere, a table football at the entrance and many other mementoes from past events. I immediately got used to hearing on a daily basis big names of the industry who are often linked with Soccerex: from federations to football clubs with the likes of Manchester United, Manchester City, Chelsea, Juventus, Inter, Liverpool, Arsenal, Napoli just to name a few. Being part of a process which helps out whoever might have interests at stake in the football industry to fulfil their business objectives makes me feel proud and also very lucky indeed. What’s more, I’m starting to have an understanding of things which up until 2 months ago seemed totally beyond my reach and this is exactly what I had been craving for. As for my day job, I’ve been focused mainly on lead-sourcing so far: finding new leads and converting them into prospects who might bear an interest in attending a Soccerex event, either as simple attendee or as a sponsor/exhibitor, which ultimately translates into new business opportunities and revenue streams for the company itself if negotiations prove to be successful. Due to this task, I’ve now also got a better view on how complex and diversified the football industry is nowadays, my horizons in this respect have been broadened to say the least. In fact, it’s not just about the big names of the industry that are familiar to everyone but also (and mainly) about many companies operating in sectors like fan engagement, performance analytics, E-sports, CRM, sports apparel, marketing, media, betting and gaming etc. which over the recent years have become main characters on stage and have now all the right to be treated as such. Having a couple more weeks to spend in here, I’m already sure that I will remember Soccerex as a worthy experience as well as a great asset in my future career and I look forward to increasing my knowledge in these final weeks as much as possible. Francesco Gizzi is a Candidate of The FBA’s Professional Master in Football Business 2nd Edition, expected to graduate in March 2019. He can be contacted via LinkedIn.